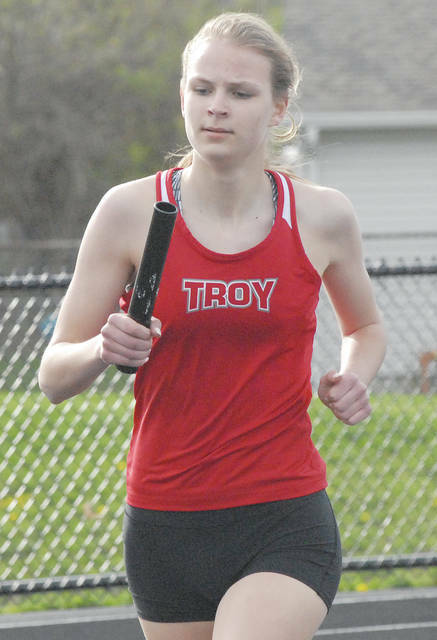 David Fong | Miami Valley Sunday News Troy’s Dinah Gigandet won both the 800 and 1,600 Friday at the Xenia Doug Adams Invitational. 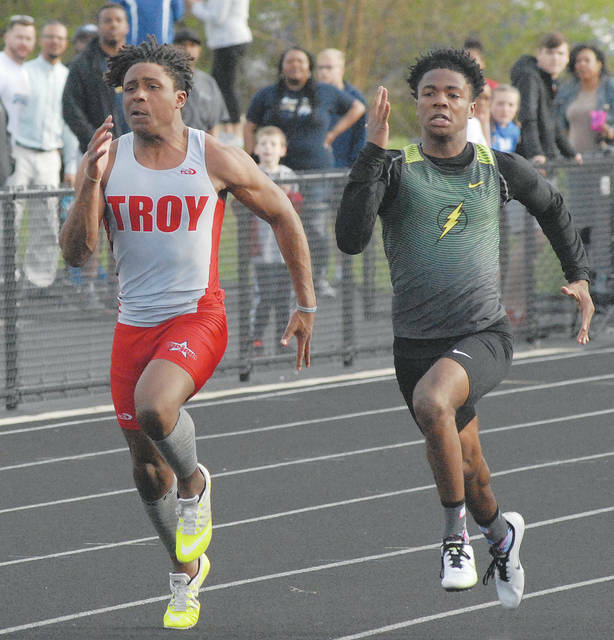 David Fong | Miami Valley Sunday News Troy’s Jaydon Culp-Bishop won both the 100 and 200 Friday at the Xenia Doug Adams Invitational. 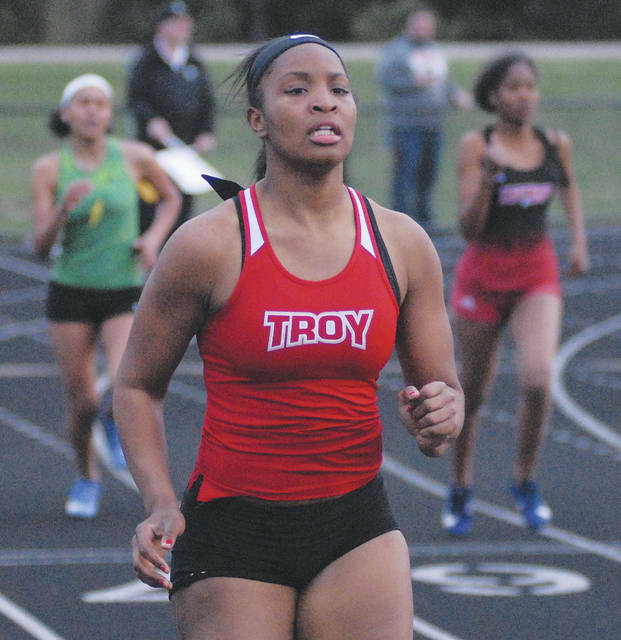 David Fong | Miami Valley Sunday News Troy’s Annah Stanley won the 100 Friday at the Xenia Doug Adams Invitational. David Fong | Miami Valley Sunday News Troy’s Anna Boezi runs her leg of the 4x800 Friday at the Xenia Doug Adams Invitational. 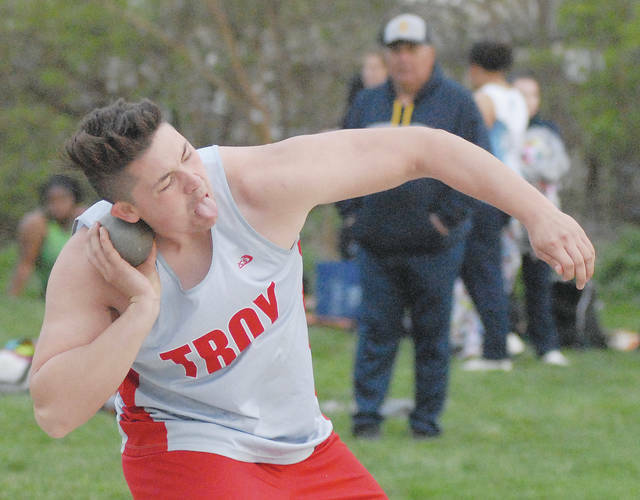 David Fong | Miami Valley Sunday News Troy’s Jesse Westmeyer placed in both the shot put (shown here) and discus Friday at the Xenia Doug Adams Invitational. 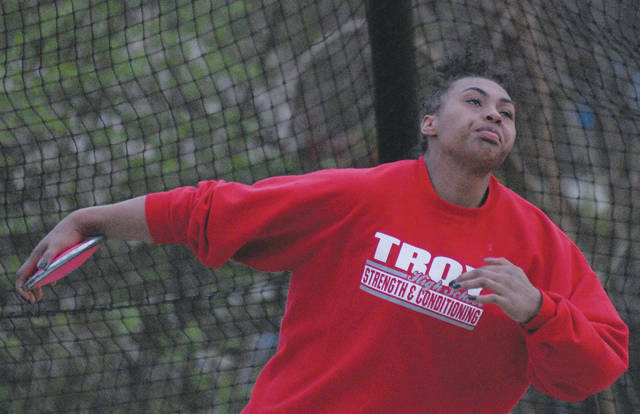 David Fong | Miami Valley Sunday News Troy’s Lenea Browder won both the discus (shown here) and shot put Friday at the Xenia Doug Adams Invitational. David Fong | Miami Valley Sunday News Troy’s Sophie Fong won the pole vault Friday at the Xenia Doug Adams Invitational. David Fong | Miami Valley Sunday News Troy’s Kiersten Franklin (left) takes the baton from Evelyn Plunkett in the 4x100 relay Friday at the Xenia Doug Adams Invitational. David Fong | Miami Valley Sunday News Troy’s Katie Castaneda placed in the top four in a pair of events Friday at the Xenia Doug Adams Invitational. David Fong | Miami Valley Sunday News Troy’s Hallie Westmeyer placed second in the high jump Friday at the Xenia Doug Adams Invitational. David Fong | Miami Valley Sunday News Troy’s Braden Coate runs the 1,600 Friday at the Xenia Doug Adams Invitational. David Fong | Miami Valley Sunday News Troy’s Blake Burton (left) prepares to hand the baton off to Caillou Monroe in the 4x100 relay Friday at the Xenia Doug Adams Invitational. XENIA — All through the early part of the season, Troy girls track and field coach Kurt Snyder talked about what his team could potentially do if it was at full strength. Friday at the Xenia Doug Adams Invitational, the Trojans finally had its full complement of weapons and showed what they could do with all its parts in place, racking up a whopping 206 points to win the invitational. Fairmont was second with 70.5 points and Northmont was third with 69 points. For the sake of perspective, Troy’s field events alone piled up 74 points, enough to win the invitational. Troy was the only team to score team points in every event and actually scored in double figures in every event but two. Leading the way for Troy was a pair of double champions. Sophomore Dinah Gigandet won both the 800 (2:32.70) and 1,600 (5:24.48). Junior Lenea Browder won both the shot put (41-9) and discus (119-9). Other individual event champions for the Trojans included senior Annah Stanley in the 100 (13.03 seconds), freshman Emma Kennett in the 3,200 (11:40.08) and freshman Sophie Fong in the pole vault (10-0). Stanley also placed second in the long jump (16-10.5). Also placing second in individual events for the Trojans were freshman Anna Boezi in the 300 hurdles (51.01 seconds), sophomore Hallie Westmeyer in the high jump (5-2), senior Katie Castaneda in the 1,600 (5:39.8), senior Olivia Tyre in the 800 (11:41.97) and senior Jessica Goodwin in the 100 hurdles (16.22 seconds). Placing third for the Trojans were freshman Hannah Falknor in the 400 (1:03.16), sophomore Brennah Hutchinson in the 200 (26.95 seconds) and sophomore Bailey Brogan in the high jump (4-8). Placing fourth for Troy were senior Alekhya Gollamudi in the 300 hurdles (52.95 seconds) and Lilli Cusick in the pole vault (9-6). The Trojans also won three relays and placed second in the fourth. The 4×100 team of Hutchinson, junior Laura Borchers, senior Evelyn Plunkett and freshman Kiersten Franklin won in 52.23 seconds. The 4×200 team of Plunkett, Hutchinson, Falknor and Franklin won in 1:47.81. The 4×400 team of Hutchinson, junior Katie Lord, Franklin and Falknor won in 4:18.84. The 4×800 team of Kennett, Lord, Gollamudi and Boezi took second in 10:50.19. The Troy boys track and field team placed fourth with 93 points. Springfield won with 127 points, Fairmont was second with 108 and Northmont was third with 99.2. Senior Jaydon Culp-Bishop was a double champion for the Trojans, winning the 100 in 11.17 seconds and the 200 in 22.33 seconds. Tucker Raskay won the high jump (6-0). The Trojans picked up big points in the throwing events from seniors Jesse Westmeyer and Spencer Klopfenstein. Westmeyer was second in the discus (137-0) and the shot put (46-0). Klopfenstein was fourth in the discus (133-10) and third in the shot put (43-3.5). Junior Austin Zonner was third in the 800 (2:08.06). Sophomore Josh Lovitt was third in the 1,600 (4:44.0). The 4×100 relay team of Noah Young, Culp-Bishop, Blake Burton and Caillou Monroe was second in 43.38 seconds. ST. PARIS — The Covington boys were second at Friday night’s Graham Invitational, posting 73 points to Springfield Shawnee’s 106 to lead the local teams competing. For the Buccaneer boys, Andrew Cates was second in the 400 (51.22 seconds), Gray Harshbarger was third in the 400 (53.58 seconds), Cade Schmelzer was third in the 300 hurdles (44.33 seconds), Tyler Fraley was third in the high jump (6-0), Kadin Presser was third in the long jump (18-2.75) and Sam Pritchard was fourth in the shot put (42-2.5). The 4×200 relay won (1:34.13), the 4×800 relay was fourth (9:06.39) and the 4×10 relay was fourth (46.48 seconds). Miami East’s boys were 10th with 27 points. Aaron Lawrence won the 110 hurdles (16.58 seconds) and Bryce Adamson was fourth in the 110 hurdles (18.62 seconds). The 4×800 relay was third (8:59.49). Covington’s girls were fourth with 80 points. Lauren Christian won the discus (115-6) and shot put (37-4.25), Morgan Kimmel won the 100 hurdles (17.88 seconds), Lilli Hamilton was second in the high jump (4-10), Paige Boehringer was fourth in the 400 (1:04.9) and fourth in the 800 (2:33.22) and Kayla Mitchell was fourth in the high jump (4-8). The 4×400 relay team was third (4:30.03). Miami East’s girls were fifth with 69 points. Gabrielle Hawkins won the 400 (1:02.74) and was fourth in the 100 (13.44 seconds), Rachel Ondera was second in the discus (112-6), Bridget Paton was third in the pole vault (8-6) and Josie DesAutels was fourth in the 200 (28.92 seconds). The 4×200 relay was second (1:55.87) and the 4×100 relay was second (54.09 seconds). PLEASANT HILL — Newton hosted and swept a quad Friday night, with the girls defeating Milton-Union 114-83 and the boys defeating the Bulldogs 94-66. Winners for Newton’s girls were: the 4×800 relay (12:52.35), McKenna Downing in the 1,600 (6:26.52) and 800 (2:53.29), the 4×400 relay (4:48.19), Natalee Carlin in the discus (71-8) and shot put (27-0.5) and Rylie Resides in the pole vault (8-0). Winners for Newton’s boys were: the 4×800 relay (10:24.09), Cameron Stine in the 110 hurdles (16.55 seconds), Ethan Cook in the 100 (11.73 seconds) and long jump (20-8.25), Ben Hoover in the 1,600 (4:57.97) and 800 (2:23.88), the 4×200 relay (45.86 seconds), Josh Ecklebarger in the 200 (24.41 seconds), Owen Via in the 3,200 (11:26.88), and Dawson Hildebrand in the discus (155-0) and shot put (52-8). Winner for Milton-Union’s girls were: Morgan Grudich in the 100 hurdles (18.06 seconds) and 300 hurdles (55.1 seconds) and the 4×100 relay (54.02 seconds). Winner for Milton-Union’s boys were: Jon Searcey in the 400 (55.94 seconds), Kyle Hultgren in the 300 hurdles (46.92 seconds), the 4×400 relay (4:08.94), A.J. Lovin in the high jump (5-10) and Carter Tinnerman in the pole vault (11-0). Troy Christian’s girls were fourth with 17 points. Kenley Blake won the 100 (13.92 seconds). Gracie Glaser won the 400 (1:09.82) and 3,200 (13:01.66). Lizzie Deal won the long jump (16-11.5). Troy Christian’s boys were third with 38 points without any individual winners. VANDALIA — The Tippecanoe boys finished fourth in the Butler Invitational, while Piqua was seventh. Tippecanoe girls finished third and Piqua was fourth. Finishing second were Brayden Underwood, 3,200, 10:47.53; and Matt Henn, discus, 108-3; while taking fourth were Corey Abney, high jump, 5-6; and the 800 relay, 1:39.02. Jasiah Medley led Piqua, winning the 100, 11.78 and finishing fourth in the 200, 23.70. Taking second was Noah Campbell, 1,600, 4:47.20; while finishing third was Mitch Fletcher, 1,600, 4:51.26. Taking fourth were Fletcher, 3,200, 10:50.87; and Ethan Heidenreich, long jump, 18-6 3-4. Katie Taylor took first in the 1,600, 5:22.61; and second in the 800, 2:28.74 for Tippecanoe; while Jaila Fletcher took second in both the 100 hurdles, 17.59; and 300 hurdles, 50.65. Also finishing second was Lauren Robbins, shot put, 31-10 1-4. Taking third were Mackenzie Dix, 800, 2:30.07; Annie Sinning, 3,200, 12:55.01; Carlie Federle, high jump, 4-4; Cassie Henn, discus, 75-3; and Ainsley McKarney, shot put, 31-5 1-2. Finishing fourth were Tori Prenger, 800, 2:33.38; Allison Brunswick, high jump, 4-4; and the 1,600 relay, 4:36.45. Piqua got wins from Ana Adams, 3,200, 12:27.72; and Colleen Cox, pole vault, 7-6. Taking second wwas Cox, 200, 27.96; and 400, 63.61; while finishing fourth were Maeve Vulcan,, 3,200, 13:30.27; Claire Bim-Merle, discus, 74-2; the 400 relay, 57.50; and the 800 relay, 1:59.51. MINSTER — The Lehman Catholic girls track and field team had a strong showing at the Minster Invitational Saturday. The Lehman Catholic girls finished fourth and Bradford was 14th; while the Lehman boys were 11th and Bradford was 14th. Lindsey Magoteaux led Lehman, sweeping the 100, 12.86; and long jump, 15-10 1-2. Lehman also won the 400 relay, 52.19. Taking second were Rylie McIver, 300 hurdles, 50.67; and the 800 relay, 1:50.18. Ella Monnin was third in the 300 hurdles, 51.40; and McIver was fourth in the 200, 27.83. Bradford boys were led by Jacob McQuinn, who finished third in the discus, 140-9. WEST ALEXANDRIA — Bethel’s girls placed 10th at the Fred Durkle Invitational Friday at Twin Valley South with 32 points, while the Bees boys placed 14th with 11 points. For the girls, Kaitlyn Balkcom won the 1,600 (5:49) and was third in the 3,200 (12:51.6), and the 4×400 relay team of Hayden Parson, Lydia Lowery, Maddie Spaeth and Kenn Gray was third (4:45.17). The Bethel boys had no top-four finishers. 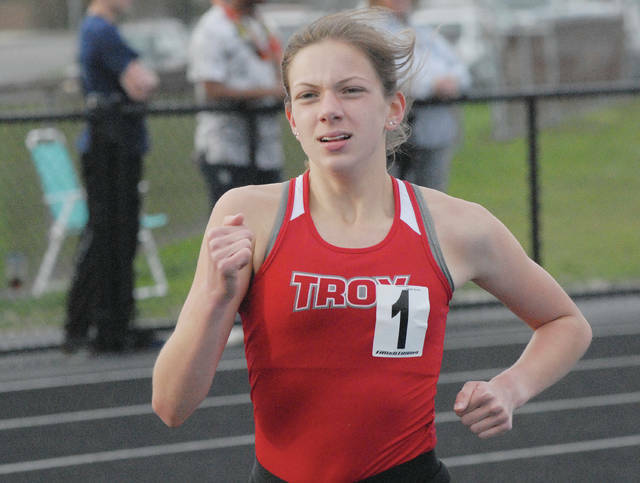 https://www.dailycall.com/wp-content/uploads/sites/30/2019/04/web1_1-gigandet.jpgDavid Fong | Miami Valley Sunday News Troy’s Dinah Gigandet won both the 800 and 1,600 Friday at the Xenia Doug Adams Invitational. 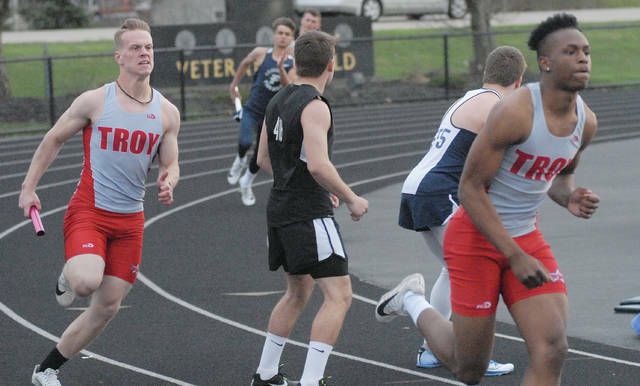 https://www.dailycall.com/wp-content/uploads/sites/30/2019/04/web1_2-jcb.jpgDavid Fong | Miami Valley Sunday News Troy’s Jaydon Culp-Bishop won both the 100 and 200 Friday at the Xenia Doug Adams Invitational. 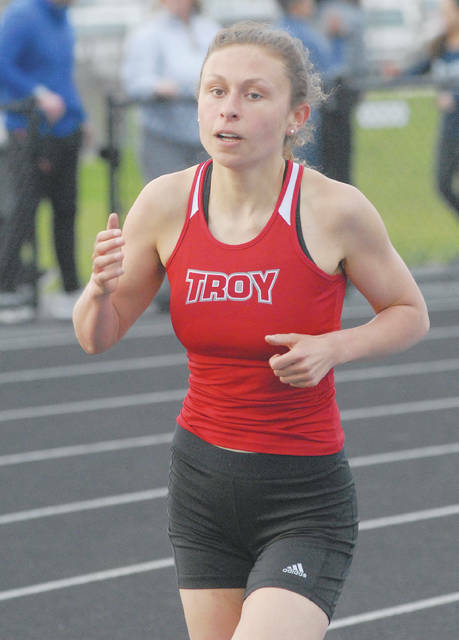 https://www.dailycall.com/wp-content/uploads/sites/30/2019/04/web1_3-stanley.jpgDavid Fong | Miami Valley Sunday News Troy’s Annah Stanley won the 100 Friday at the Xenia Doug Adams Invitational. David Fong | Miami Valley Sunday News Troy’s Anna Boezi runs her leg of the 4×800 Friday at the Xenia Doug Adams Invitational. https://www.dailycall.com/wp-content/uploads/sites/30/2019/04/web1_4-boezi-4×800.jpgDavid Fong | Miami Valley Sunday News Troy’s Anna Boezi runs her leg of the 4×800 Friday at the Xenia Doug Adams Invitational. https://www.dailycall.com/wp-content/uploads/sites/30/2019/04/web1_5-jesse-westmeyer.jpgDavid Fong | Miami Valley Sunday News Troy’s Jesse Westmeyer placed in both the shot put (shown here) and discus Friday at the Xenia Doug Adams Invitational. https://www.dailycall.com/wp-content/uploads/sites/30/2019/04/web1_6-browder.jpgDavid Fong | Miami Valley Sunday News Troy’s Lenea Browder won both the discus (shown here) and shot put Friday at the Xenia Doug Adams Invitational. 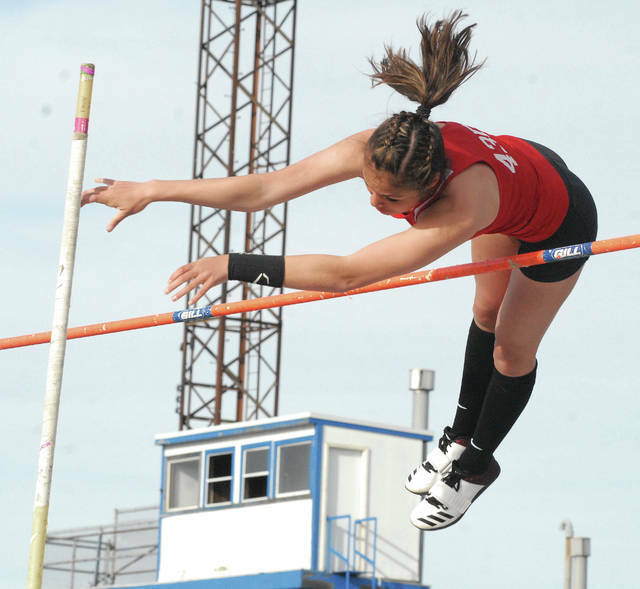 https://www.dailycall.com/wp-content/uploads/sites/30/2019/04/web1_7-fong2.jpgDavid Fong | Miami Valley Sunday News Troy’s Sophie Fong won the pole vault Friday at the Xenia Doug Adams Invitational. David Fong | Miami Valley Sunday News Troy’s Kiersten Franklin (left) takes the baton from Evelyn Plunkett in the 4×100 relay Friday at the Xenia Doug Adams Invitational. 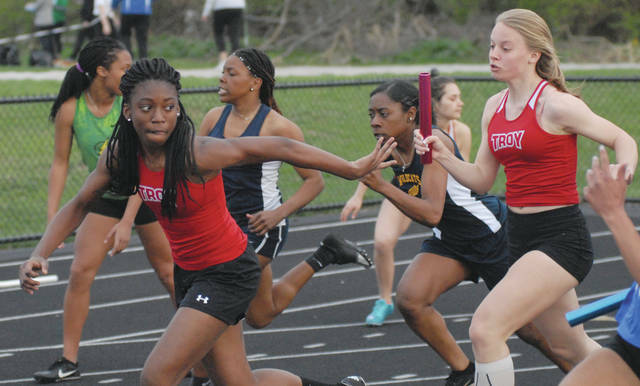 https://www.dailycall.com/wp-content/uploads/sites/30/2019/04/web1_8-plunkett-to-franklin.jpgDavid Fong | Miami Valley Sunday News Troy’s Kiersten Franklin (left) takes the baton from Evelyn Plunkett in the 4×100 relay Friday at the Xenia Doug Adams Invitational. https://www.dailycall.com/wp-content/uploads/sites/30/2019/04/web1_9-castaneda.jpgDavid Fong | Miami Valley Sunday News Troy’s Katie Castaneda placed in the top four in a pair of events Friday at the Xenia Doug Adams Invitational. 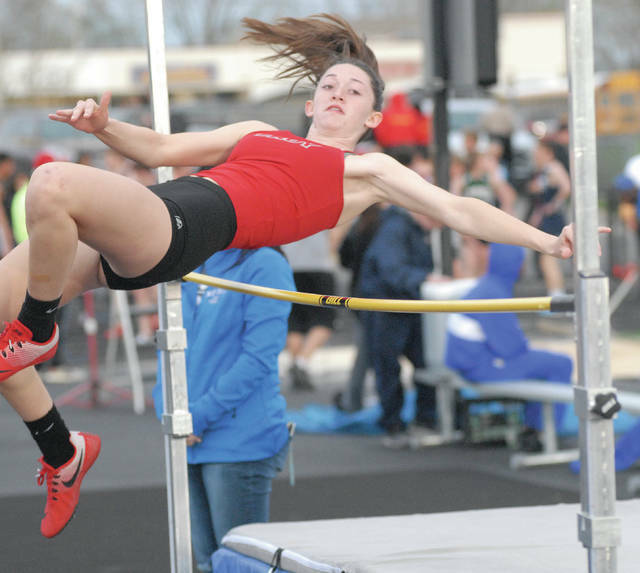 https://www.dailycall.com/wp-content/uploads/sites/30/2019/04/web1_10-westmeyer.jpgDavid Fong | Miami Valley Sunday News Troy’s Hallie Westmeyer placed second in the high jump Friday at the Xenia Doug Adams Invitational. 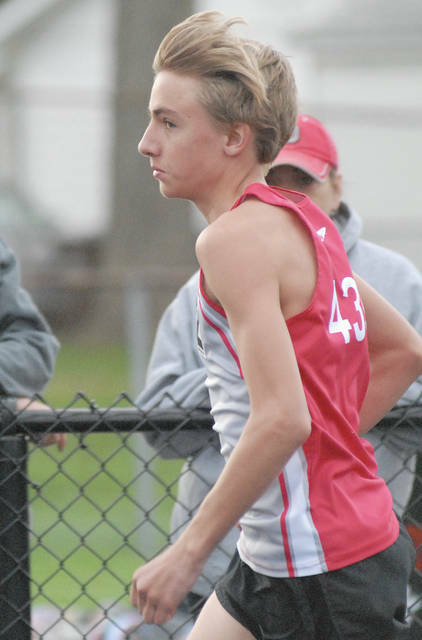 https://www.dailycall.com/wp-content/uploads/sites/30/2019/04/web1_11-coate.jpgDavid Fong | Miami Valley Sunday News Troy’s Braden Coate runs the 1,600 Friday at the Xenia Doug Adams Invitational. David Fong | Miami Valley Sunday News Troy’s Blake Burton (left) prepares to hand the baton off to Caillou Monroe in the 4×100 relay Friday at the Xenia Doug Adams Invitational. https://www.dailycall.com/wp-content/uploads/sites/30/2019/04/web1_12-burton-to-monroe.jpgDavid Fong | Miami Valley Sunday News Troy’s Blake Burton (left) prepares to hand the baton off to Caillou Monroe in the 4×100 relay Friday at the Xenia Doug Adams Invitational.